Just as eating one certain food won't guarantee weight loss, eliminating a specific food doesn't equal an easy fix when it comes to weight management. Any food, in moderation, can be a part of your weight-loss strategy, as long as you limit your calories. If you emphasize healthy foods, such as whole grains, fruits, vegetables and lean proteins, while monitoring your calorie intake, you can easily incorporate rice without sabotaging your weight-loss goals. While eliminating rice from your diet probably won't produce any negative effects, grains such as rice are important in a balanced diet. Dietary guidelines suggest that 45 to 65 percent of calories should come from carbohydrates, including grains. The U.S. Department of Agriculture recommends that adults get five to eight servings of grains daily, depending on calorie needs, noting that whole grains are generally healthier than refined grains. Although brown rice provides more fiber and nutrients than white rice, both can play a part in your eating plan without interfering with weight loss. Although brown rice is a healthy option when it comes to getting enough carbohydrates, your portion sizes may be the culprit if your scale isn't moving in the right direction. A 1/2 cup of rice is one serving. 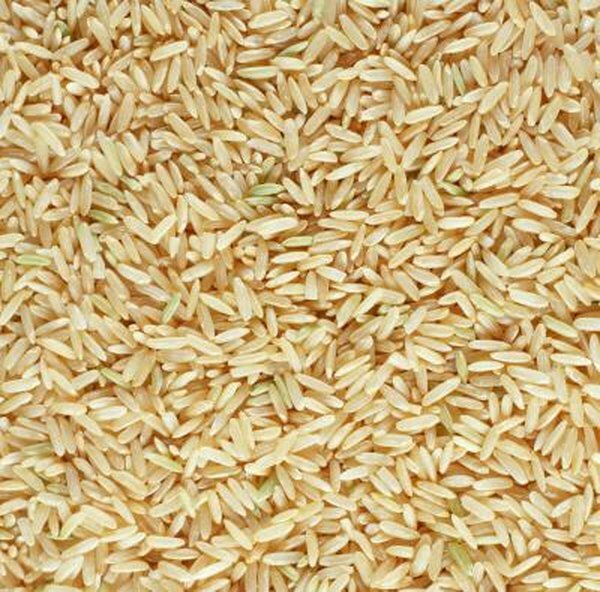 Brown rice provides 106 calories per serving, while white rice provides around 85 calories. Without measuring your portions, you may consume more calories than you realize. Vary your grain choices and choose whole grain varieties as often as possible. Measure out your servings so you can accurately track and control your calories. While it's a good idea to monitor your calories from rice, your overall caloric intake plays the most significant role in weight loss. Too many calories from any source, rice included, can prevent you from reaching your weight -goals. Keep a food journal so you can identify problem areas in your eating plan. Setting a daily calorie target will help you stay on track. Ultimately, you need to consume 500 to 1,000 calories fewer than you burn each day to support weight loss of up to 2 lb. per week. Rather than avoid rice altogether, eat a variety of whole grains and watch your portion sizes. Include filling fruits and vegetables in your eating plan, aiming for up to nine servings a day for optimal nutrition and satiety. Limit saturated fat sources, including butter, a common ingredient in rice dishes. Instead, season rice and other foods with herbs and spices. If you have diet-related health concerns or a history of heart problems, consult with your doctor before changing your eating plan.